Whether retrofitting existing towers (microwave, cell) and relay stations or building new ones, the new UniTran Manual Transfer Switch and Panel/Link TTH Generator-Ready main breaker load center help enable telecommunications companies meet supplier requirements for easy switching to back-up power sources. Transfer switches permit the convenient use of a portable generator during power outages. 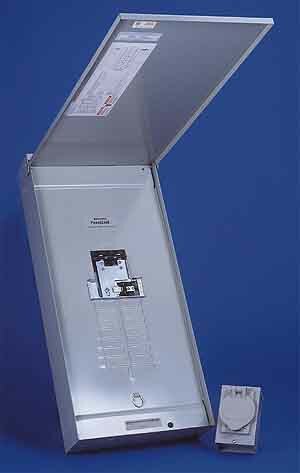 The transfer switch is well suited for retrofit applications of towers and stations. Rated at 120 volts, the single-pole, double-throw switch wires into the existing load center and can be switched manually to transfer power from up to a 2,500-watt generator through the load center to a facility's critical circuits. Cabling from the generator plugs into the switch in seconds, so that back-up power can be accessed in minimal time. When space constraints do not allow the switch to be installed adjacent to the existing load center, the load center can be retrofitted with the new Panel/Link TTH unit. Built primarily for new tower and station installations, the new load center features a built-in manual transfer switch (interlock mechanism) that also permits quick, convenient use of up to 30 kW of power from a generator source. Built into a NEMA 3R outdoor cabinet, it allows only one power source/feed at a time to the breaker box's split copper bus. These include either power from the utility grid into the main breaker (rated up to 200 amps), or power from an external generator to the double-pole breaker (up to 125 amps) built into the load center. Panel/Link can be installed flush or on surface and can be used in both residential construction and in retrofits of existing wiring installations. Featuring a full 4-¼-in. side wiring gutter, the box contains all the service connections and breaker knock-outs of a traditional box. To avoid the need for an opening (door or window) for the generator cord to an interior connection to Panel/Link, the manufacturer has designed an optional power inlet box that can be installed outdoors for easy plug-in of the generator. The rain-tight (NEMA 3R) box uses a patented design that provides generous wiring space and makes it easy for electricians to rough in the box. Reliance Controls, 2001 Young Court, Racine, WI 53404. Tel: 262-634-6155; Fax: 262-634-6436.